Teacher Appreciation Week was on the 7th until the 11th of May 2012, which gave us at Teachers Insurance Specialists the perfect opportunity to show teachers how thankful we are for all that they do. Glue sticks, markers, books and paper, oh, my! Although many schools provide teachers with a small budget for school supplies, those funds are often insufficient to cover all of the classroom needs. We’ve found that the majority of teachers spend hundreds of dollars every year out of their own pocket. In fact, only a handful of our teachers stated that they never dipped into their wallet to pay for supplies. Personal spending seems to be the norm for most educators, in a profession that already demands intense commitment. One of the key supplies they need are reams of paper for student copies of class projects. 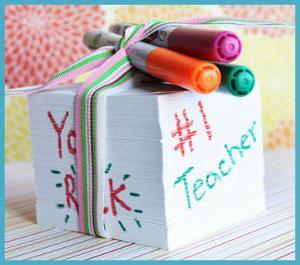 For the past three years we’ve run our Reams of Appreciation program for our teachers. We’ve provided thousands of complimentary reams of paper to our teachers. Thank you teachers for who you are and what you do! You Rock! Call me to get your school on our list for next year!